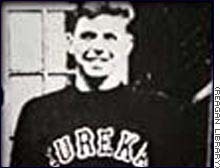 Ronald Reagan spoke publicly and became a leader in a student strike movement on the Eureka College campus. After successfully staging a five-day strike, the student demands were met and Bert Wilson, the president of the college, was forced to resign. As the college bell started to ring, students and faculty marched across campus in protest. Dutch, a well-known freshman, was selected to be the student spokesman at the rally. Calling for a student strike to protest the underhanded action of the administration, the crowd roared.